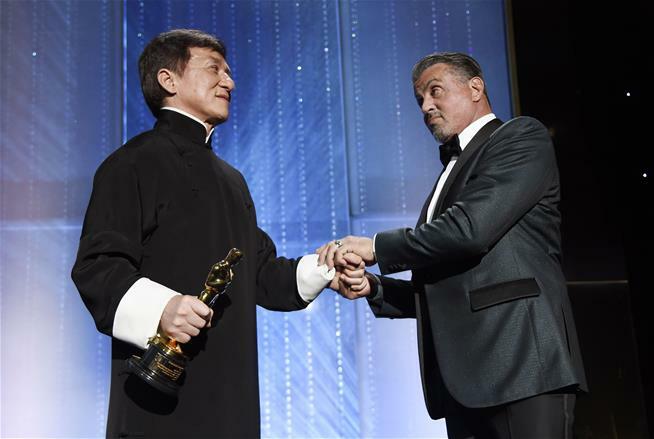 (P2) Chan was also introduced by co-stars Michelle Yeoh and Chris Tucker, who called him a “living legend,” People reports. In his acceptance speech at the Hollywood event, Chan praised hometown Hong Kong and all the people who helped him get where he is. “My dad always said, ‘Son, you get so many movie awards in the world, when are you going to get one of these?”, he said. “Then I just look at my dad. ‘Ha, ha, ha. Dad, I only make comedy action movies. '” Casting director Lynn Stalmaster, documentary maker Frederick Wiseman, and film editor Anne V. Coates were also honored. What genres of movies do you like to watch? Why? Who are some of the famous entertainers from your country? What are they famous for? What advice has your mother or father given you? How many years has Chan been acting? Which two types of movies is Chan known for? Who presented Chan during the ceremony? What are the names of the other three individuals recognized with the same award?